The Settle Carlisle Railway guide (or ‘Black Book’ as it’s more commonly known) has become a familiar site on the Settle-Carlisle trains. First launched fifteen years ago, the eighteen-page book is a fascinating source of information about the line. Here, you can read about the early controversy surrounding the building of the railway, along with interesting historical facts about the towns along its route. The book has just been updated with new images and some up to date details about the railway today. Richly illustrated with line drawings, maps and photographs, it greatly enhances the enjoyment of a trip on the railway – in fact, it’s the ideal travel companion: full of fascinating information but unlikely to try and eat your crisps. 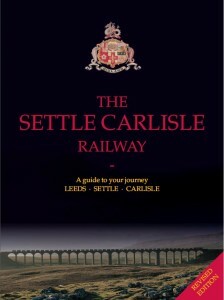 The book can be purchased from the on-train refreshment trolleys and is also sold by volunteer guides from FoSCL (The Friends of the Settle Carlisle Line) if they are on board. Alternatively, if you’re feeling really organized, it’s possible to plan ahead and purchase a copy online here.